Melt button in fry pan over medium heat; add onions, mushrooms, and spices. Brown lightly for 5 minutes. Add cranberry sauce, stir until well mixed. Pour mixture over bread in large bowl; gradually pour in turkey stock until moistened. Stuff into turkey cavity and roast. Important: Always stuff the turkey just before cooking it – never stuff the turkey ahead as bacteria can grow and make you quite ill. 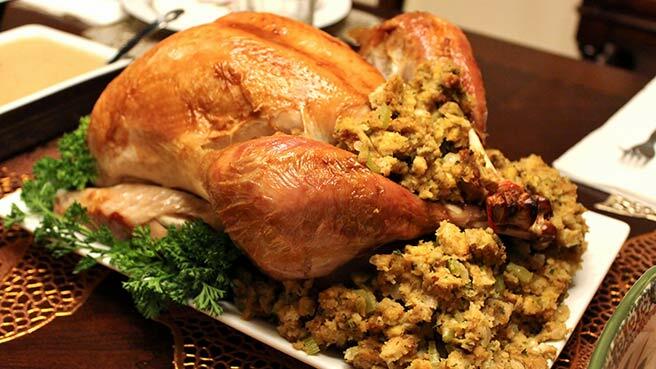 Recipe courtesy of JD Farms – Specialty Turkey Store & Bistro, Langley BC.